So yesterday should have been a walk up another munro – Beinn Ime, taking in Beinn Luibhean on the way down. 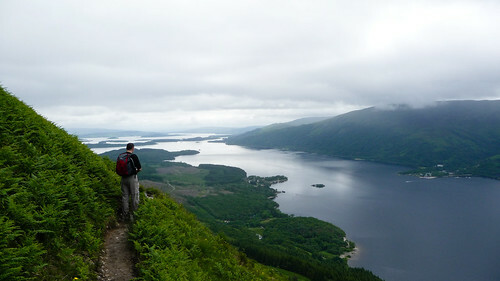 It would have been quite a long walk but the views from Beinn Ime would be worth it. However the weather was quite a bit worse than we expected and our route following was crap! Firstly we marched off from the car park down the wrong path, realising only when we’d walked a mile. So we walked back to the road and made probably our second bad choice of the day. 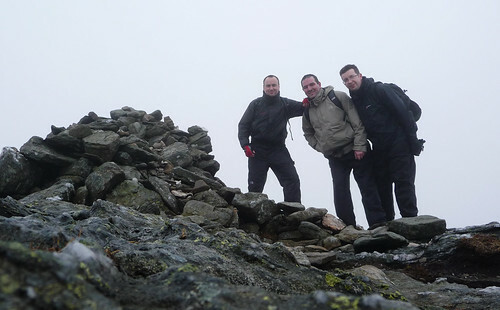 We decided to tackle the corbet, Beinn Luibhean, first and then onto Beinn Ime. The ground was pathless, boggy and quite heavy going. After a couple of hundred metres it started to get very windy. In fact we were blasted by 40-50mph winds for the next hour before we finally made it to the top of Beinn Luibhean. We were wet, cold and faces were red raw from the wind. Welcome to summer hill climbing in Scotland. We found some shelter and decided not to carry on. Ime, like Luibhean, was shrouded in cloud with zero chance of any view. We were also pretty bushed already as the heavy ground and fighting the wind had taken it’s toll. On descending the cloud broke a little and the rain went off so at least I got a few photo’s. Also stumbled across a muddy and broken path which helped but not by much. In fact it was a slog back down which was pretty slippy, especially with lots of small logs lying underfoot which I think caused all of us to slip/fall one way or the other. Thankfully no injuries! The RunKeeper output from yesterday shows our mistake at the start and also the odd route we took up and the more direct route down. One app I might try for next time is Trailhead from The North Face which allows you to download routes to your iphone prior to the walk so you can track how close you are to the recommended route. Would certainly have helped yesterday. One other note – battery life on the iPhone 4 is much improved on the 3 and 3GS. Used just under 50% of the battery while using RunKeeper which is excellent for a 5 hour walk. The full set of photo’s are available on Flickr. Used a new camera bag yesterday, the Kata H-10, which proved very useful in the rain and wind. I had it hooked onto the waist strap of my bag which felt quite comfortable and kept the camera fully protected. The rain cover that comes with the bag was invaluable! Check your bearings before setting off. We had compass and maps but failed to use them properly. 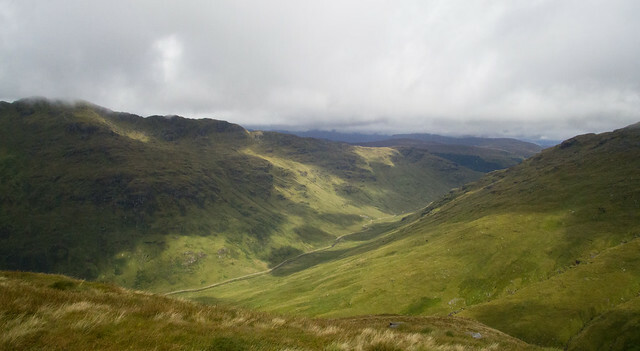 Tackle the munro first, then worry about other surrounding climbs. Respect the weather. Mountain Weather Information Service provide accurate forecasts, and winds gusting to 55mph are not to be sniffed at. Weather in July and August can be cold, wet and wild in Scotland. We cancelled a walk at the start of July due to 90mph gusts and yesterday got pretty cold in the wet and biting winds. Be prepared for all weathers no matter the time of year. Just a shame we didn’t arrange the walk for today – glorious weather by the looks of it. We’ll keep Beinn Ime for one of those days. After getting back in the swing with a walk up Tinto Hill it was time to tackle another munro. We had planned to do Schiehallion back in July but illness, holidays and finding a suitable weekend meant it never happened. So last Saturday we got up early and headed up to Perthshire. It was a two and a bit hour drive but empty country roads were fantastic. We were also pretty lucky with the weather and the day was dry with some clear spells. One very lucky find was Loch Lubnaig just to the north of Callandar. Mirror like surface and some great photo’s. I don’t often think about a DSLR but this was one of those times that I knew a better camera would have been very handy. Onwards to Schiehallion which is 3547ft/1083m high and thanks to a well maintained car park and excellent path is fairly popular. As we climbed up the sun started coming out and it was getting pretty warm. The climb up is fairly steep but as I mentioned previously it’s helped by a great path. However the path doesn’t take you to the summit. You think your at the top but you’ve got around another mile of rocks and boulders to navigate before you get to the cairn. This was the trickiest bit of the walk and I can only imagine it’s fairly treacherous on a wet day. However it only took a couple of hours to get to the summit from the car park. Not long after these photo’s were taken the cloud rolled in and it got very cold -fleece and gloves required while we ate lunch and got going again. We were now on the north side of the hill and it was very slippy – I managed to cut my shin in four places as it slipped down a rock and you had to tread carefully to avoid a sprained ankle. We could have taken the old path back down but it had badly eroded the hill hence the newly constructed oath so we were respectful and retraced our steps back to the car park. 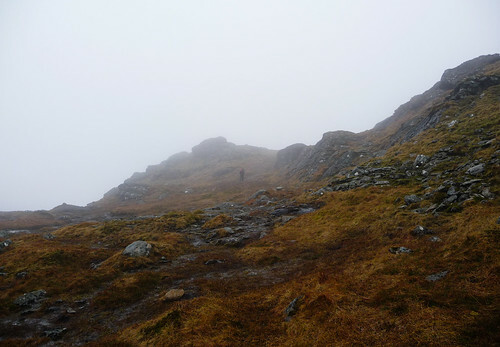 This was a great walk and one that anyone could do as long as you’ve got the right footwear for the rocks on top and also remember that at this time of year it can be very cold and windy at the top of a munro compared to conditions on the ground. A full set of photo’s can be found on Flickr. 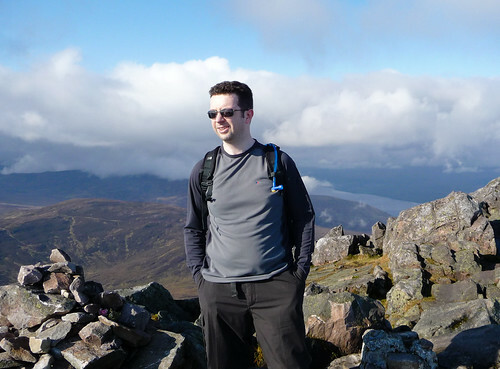 My latest walk was last weekend and was up probably the most popular Munro in Scotland – Ben Lomond. With it’s proximity to Glasgow and a path all the way to the top it’s easy to see why so many people climb it. 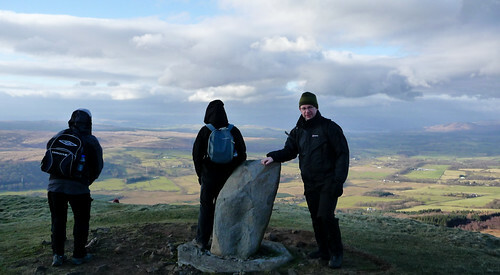 Unfortunately the weather last Sunday meant that the view’s all the way up, including at the top, were very poor. The photo above show’s what a grey driech day it was. Ugghhh. Worse the little blacks dot’s you can see in the photo’s. Midges. The little bastards loved me and I ended up with around 100 midge bites. I’ve spent the last week trying not to scratch them as they are itchy as hell. I’ve been told to eat plenty of garlic before my next walk as that seemingly act’s as a deterrent. Time will tell although I’d appreciate any advice if someone know’s better! The other issue with Lomond was just how busy the route was. We took the tourist path to the top and there were just too many scallies for our liking. You never felt you were in the great outdoors. After escaping the summit and grabbing some lunch away from midge hell we took the trickier route back down and we were rewarded with a far more interesting, trickier route which was quieter too – woo hoo. Even better, the clouds lifted slightly meaning we did get a couple of nicer pic’s. 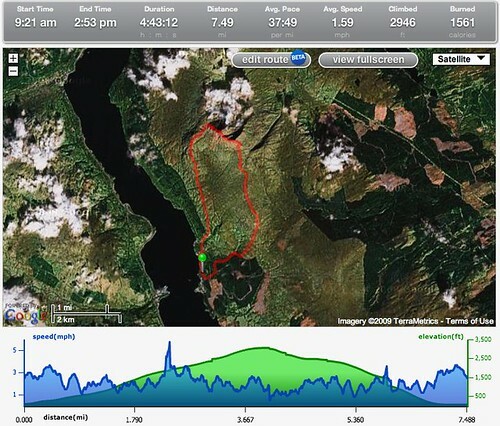 I loved the walk down and next time I do Lomond I’ll be taking this route up and down as it really made the day for me. One other lesson was I need to drink more – I ended up with a migraine after the walk and feeling pretty dehydrated – not smart at all and something I’ll need to be careful with next time. Lot’s more liquid before and during the walk are required especially in the hotter weather. 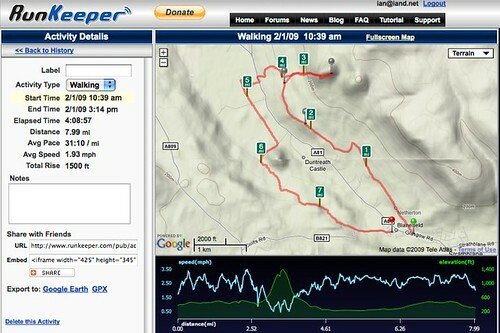 This was the first walk with the iPhone 3GS and Runkeeper. Never let me down once and the battery life, I think, is better or the 3GS than the 3G but not by much. The full Flickr set is available here. Looking forward to the next walk already – here’s hoping for better weather. Took advantage of a holiday on Good Friday to tackle my third walk. We weren’t sure whether to head further up North but we decided on something closer to home, and something a bit bigger. 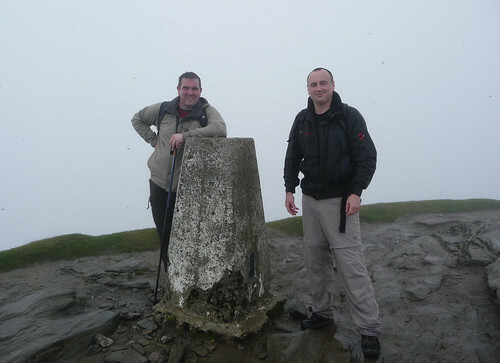 So we headed to the top of Loch Lomond to tackle Ben Vorlich. 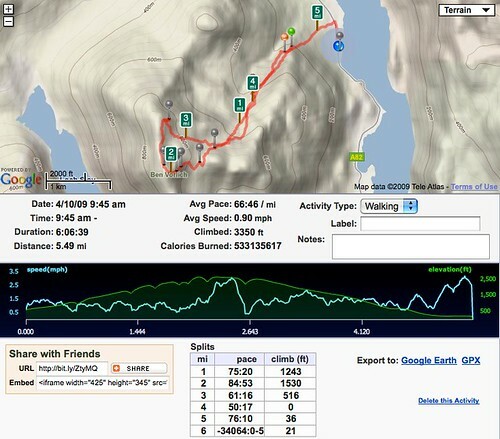 This would be my biggest walk so far and also my first munro – Ben Vorlich is 943m, so just over the magic 3000ft mark. It also turned out to be far more difficult than expected. We started around 9AM and according to the guide books it should have taken around five hours. We took just over seven. Partly this was down to taking plenty stops as it was hard going. Partly it was down to never finding a path up or down Ben Vorlich which made it far more tiring. 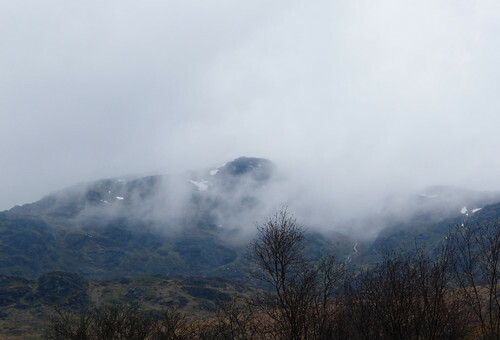 The weather started off a bit wet and we couldn’t see the summit due to the low cloud. We could still see snow though at the top. We hoped the low cloud would lift but unfortunately it didn’t so views were limited which is a shame when you look at some of the views we could have got. The ground was very heavy – boggy, muddy and it made most of the trip up quite a slog. Thankfully the rain lifted though and the cloud lifted a bit but as we neared the summit we lost quite a bit of visibility. The other problem with the low visibility was the false hope that we were near the summit. Quite a few times we thought we were nearly there…but we weren’t. However the feeling when we finally got there was great. After finding some shelter from the cold wind and having a well deserved lunch we found and followed a path that should take us west and down. However we lost the path again and after descending quite quickly came to a stop – a ridge with a fairly steep drop. So it was double back time. We ended up cutting across and following the route back down as at least we knew where we had come from. However even then we took a couple of odd routes which added a wee bit to the trek. Yet again RunKeeper worked really well. 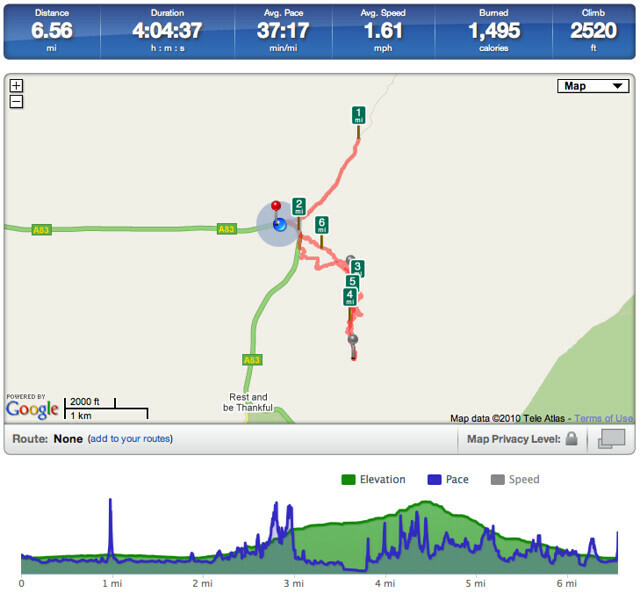 It tracked the route apart from the first 1/2 mile which was my fault for not starting the app. Oops. I’ve also just realised that the route can be exported into Google Earth so you can truly see what route you took in stunning 3D. 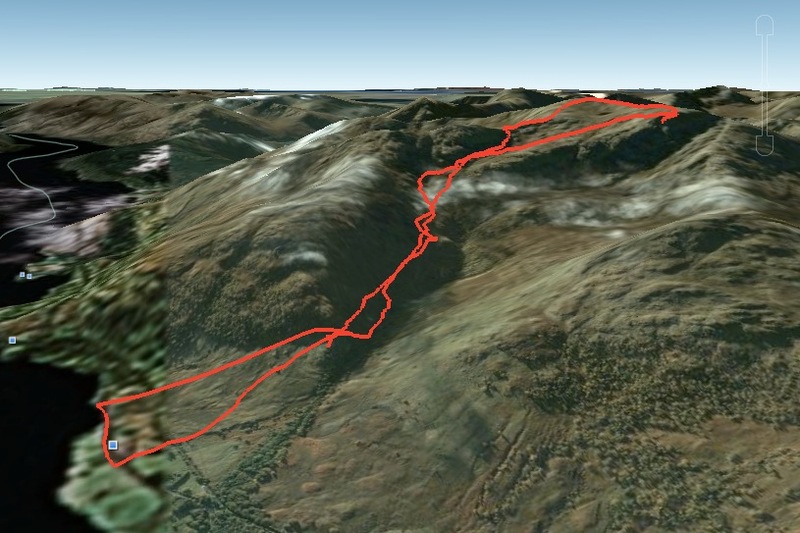 Speaking off Google Earth, this kmz file will load locations and details of all 284 Munros. This walk taught me a few things. Firstly, the next walk will need a bit more preparation. We didn’t follow the route, didn’t research it enough and made the walk far harder as a result. It would be also wiser to try and organise the walks for clearer days but this isn’t always possible and you just need to make the best of weather sometimes. Just a shame yesterday wasn’t a bit clearer. It also made me appreciate carrying cold weather gear just in case. At ground level yesterday it was quite mild. At the summit it was around zero degree’s and pretty windy. Fitness is also an issue. 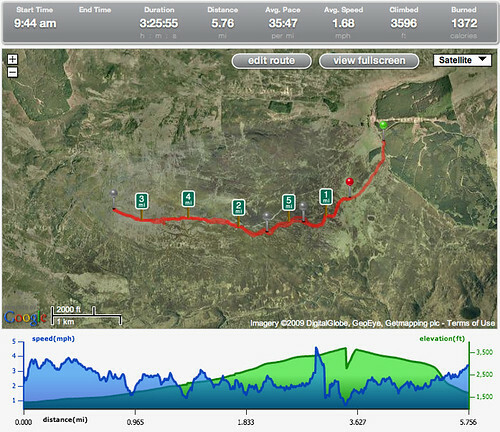 It was a hard slog up yesterday but my legs, particularly my thighs, are really sore today. It’s not so much the fitness on the day but my recovery that is poor. Hopefully that improves with further walks through the year. The aspect I liked most was the isolation. We were the only three on Ben Vorlich yesterday which made it all the more special. It was great to drive for just an hour and spend the day without seeing anyone else. The feeling on reaching the top was also good. A real sense of achievement. Full set of photo’s are now up on Flickr. Hopefully next months walk will have less cloud! Another Sunday, another hill walk. 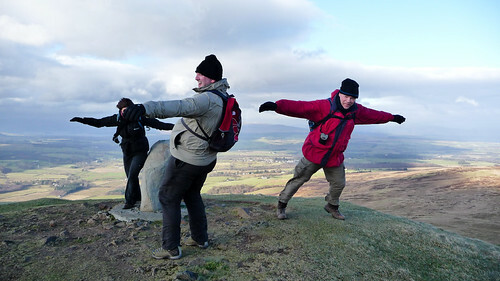 This time we headed to the Campsies, just North of Glasgow (20 minutes from my house) to take on Dumgoyne. Dumgoyne is a volcanic plug and is 427m high. This was higher than last week and the total walk was also longer. The start was fairly tame and the first two and a half miles had hardly any incline. We started from Strathblane so if you want to cut out the walk to and from Dunboyne start from Glengoyne Distillery. This will save around 4-5 miles of walking. The climb itself was far steeper than last weeks. Lot’s of stops were required on the way up but the views as you ascended were superb. The wind picked up as we got near the top but nothing prepared us for the gale that was blowing at the summit. It was unbelievably windy and cold with it! The last couple of walks have really taught me to not underestimate the different conditions you can get as you start to get higher/more remote. While the ascent was tiring, the descent was quick but also very tricky. Lot’s of concentration required and a few tumbles on the way down but we got there in one piece. The full flickr set can be found here. I used Runkeeper again to track the walk and it worked really well. One issue I had last time was battery life. This time I made sure wi-fi and 3G were disabled which helped but I also bought a battery pack to extend the iPhone’s life. The Kensington Battery Pack and Charger gives me 1 and a half extra charges on the iPhone. So instead of a three hour walk being the limit I should be able to get walks of up to 7-8 hours. It’s not the most ergonomic of deigns and isn’t as nice as some of the case models like the Fastmac but I needed one quickly and it will do for now. Some of the user reviews haven’t been the best for the Kensington sighting drop in charge capacity after a few uses – I’ll be sure to update the post if I find similar. I just love the detail that Runkeeper provides like speed and height change and on the two walks done so far it has been very accurate. Highly recommended. Next walk – not sure. In four weeks time there is talk of a coastal walk which sounds a nice alternative. I may try and get out for a walk in a couple of weeks time though that depends on weather and schedules which aren’t too predictable right now. Feeling tired right now though and I’m sure I’ll be stiff and sore tomorrow but it was definitely worth it. I loved this walk today – might even do it again in the summer on a clearer day.